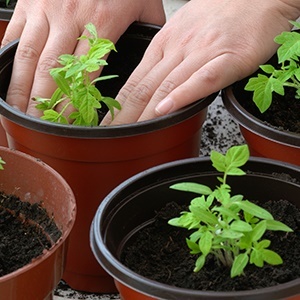 Here’s how to make your very own pots for all your favourite plants. NOTE: The outer container must be at least 1cm larger right around than the inner container. 1 Wash the plastic container that you will be using for the outside, such as an empty cool drink bottle, and cut the top off at the desired height. Put it to one side for the time being, with the smaller inner container. 2 Put on your dust mask and rubber gloves – keep them on for the entire process. 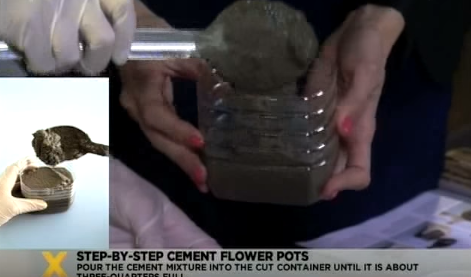 3 Place two parts building sand and one part cement into your bucket and mix together with your metal spoon. NOTE: We were able to make quite a few pots in one session with two litres of building sand and one litre of cement. 4 Add one part water (one litre, in our case) a little at a time while stirring. When you have added about three-quarters of the water, check the consistency of the mixture – it should look like thick yoghurt. Add more water if necessary. 5 Pour the cement mixture into the cut container (for the outside) until it is about three-quarters full. Tap lightly against the side of the container to remove any bubbles. 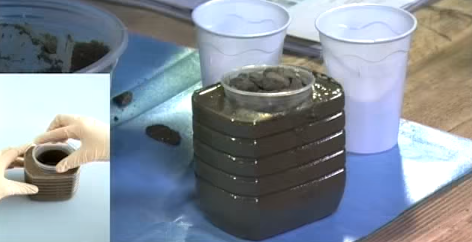 6 Press the inner container into the centre of the outer container – don’t let the cement mixture overflow, and add more if it doesn’t reach the top. Remember there must be at least 1cm between the bottoms of the two containers. 7 Place some stones in the inner container to keep it in position. Leave to stand for a few hours to harden. 8 When the cement is hard, remove the stones and place the pot in its moulds into a bucket of water for about 24 hours – this is to strengthen the cement. 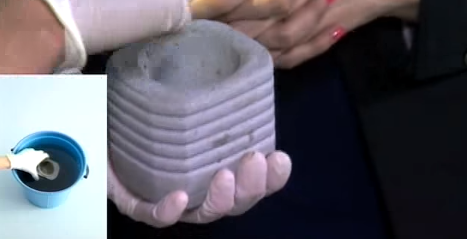 NOTE: Don’t skip this step because if you remove the moulds at this stage, the cement may crack. 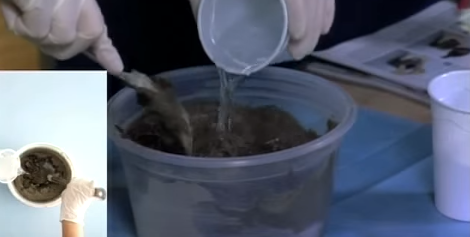 9 Remove the pot from the water and pull out the inner container with pliers. Use your craft knife to make a cut into the outer container. 10 Use your pliers to pull the outer container away from the pot, starting at the cut. 11 Level off the rim of the pot with a piece of coarse sandpaper. Rub with your fingers and rinse it in water to make it smooth again. 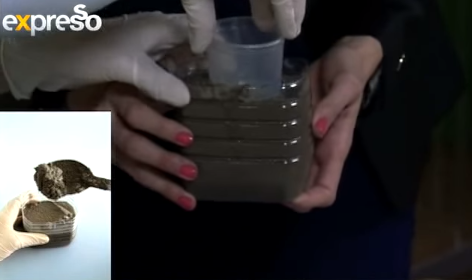 12 Drill a drainage hole in the middle of the pot – work on a wooden block. Leave the pot to stand for a day or two to dry.